1 Now after the Sabbath, as it began to dawn toward the first day of the week, Mary Magdalene and the other Mary came to look at the grave. 2 And behold, a severe earthquake had occurred, for an angel of the Lord descended from heaven and came and rolled away the stone and sat upon it. 3 And his appearance was like lightning, and his clothing as white as snow. 4 The guards shook for fear of him and became like dead men. 5 The angel said to the women, "Do not be afraid; for I know that you are looking for Jesus who has been crucified. 6 "He is not here, for He has risen, just as He said. Come, see the place where He was lying. 7 "Go quickly and tell His disciples that He has risen from the dead; and behold, He is going ahead of you into Galilee, there you will see Him; behold, I have told you." 8 And they left the tomb quickly with fear and great joy and ran to report it to His disciples. Here both Jesus‘ enemies and Jesus‘ friends got their lives’ experience. Something they never ever could have thought of. A heavenly being descends from heaven, among them, and the dead is resurrected. He lives! In our days there is much talk about, that the preaching must be current and talk into our situation today etc. But the way this is done, appears frequently, to be that one withdraws more and more from Gods words testimony, and speaks instead about everyday situations, which people are meant to "recognize." But the solution is always this - that The Holy Spirit is doing The word of God living and current for us. "They left the tomb quickly with fear and great joy." (v.8a). You can ask: Does anything indicate, that what had happened here, had anything to do with them? Was it current for them? Ask next time you are reading the funeral announcement in the paper, or follow a person to the grave: "Does it have any importance for us human beings, that Jesus is the Resurrection and the Life?" Does what happens here, say anything current about and unto Jesus’ enemies and opponents? e.g. they who sat as armed guards, to prevent His further act. Here we are seeing how much it is worth, when God intervenes. "The guards shook for fear of him and became like dead men.” (v.4). But unto Jesus‘ friends the angel turned with the well-known greeting from The Scripture: Do not be afraid! You who have taken your refuge unto Jesus, hear this greeting to you today? Do not be afraid! We human beings, we can also say that to each other, to comfort in a given situation, that is so, but generally we have no basis for it. Think e.g. a person who has been with the doctor, and there has got the “death sentence” - I assume that your: "Do not be afraid!" would have been difficult to express then! Oh how little, I myself, actually am, as a human being. In The Scripture on the other hand, it is always given a reason for this - "Do not be afraid!" as here: "He is not here (in the grave), for He has risen!" Therefore, do not be afraid! And Jesus Himself, when He uses it: "It is I; do not be afraid!" And: "Take courage, son; your sins are forgiven!" and the like. Here, in our text: He whom you are looking for has risen, and the resurrected is the crucified, whom you are looking for. Therefore, do not be afraid! Nothing is so dangerous in Christian preaching, as what is correct according to the wording, but are given a different content than The Scripture does. For what is said here, is certainly “according to the wording,” biblical truth, which all of us preach. But then you detect, in a number of cases, where this accentuates, that the resurrected is set contrary to the crucified. The resurrection acclaims and adores, in other words, in practice. Christ in His glory, in the elevation - while the cross and the degradation is shovelled in the background, and you ends up with Antichrist. It is precisely the cross the opponent will take away. The Christ of the Scriptures, is He who lived His perfect life down here, in poverty and degradation, as human being, and with that fulfilled the Law of God in our place, for thereafter to give this, his perfect life, to atonement for our sins on the cross. There is no contrast between the crucified and resurrected, it is the same person. Take the one away and you have got another Jesus. It was most certainly this, which in high degree had happened in the Corinthian congregation, and which Paul struggles so intensely to free them out of. Because there is of course, no salvation in another Jesus. The Christ who now is in the glory, that is precisely the Christ who was crucified in our place. If not, he could not vouch for us today, because the Christ who reveals before the throne of God, in your place, in this particular hour, to rescue you, He reveals as a lamb being slaughtered. That is what the Rev. 3:6 tells us. It will accordingly say, that He reveals Himself as crucified before the throne of God. And we should accordingly disregard that? Such is the way of the devil in his seduction, and as we are seeing clearly enough by Jesus‘ temptation in the desert, he is by no means afraid of using the Word of God for this act. If we really believe that, we most certainly have reason to be more careful. 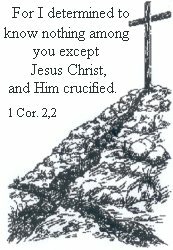 Those who were seeking the crucified here, got message about His resurrection. "They left the tomb quickly with fear and great joy." (v.8). Fear, because they had experienced something supernatural, and some of the infinitely power, which is within God, but nevertheless great joy, because of the message they had heard. Have you ever experienced any joy, because of the same message? "Go quickly and tell His disciples that He has risen from the dead; and behold, He is going ahead of you into Galilee, there you will see Him; behold, I have told you." (v.7). Note, how many times the angel is saying you, here in this short speech. It concerned them! Your Jesus, He whom you have taken your refuge to, and whom you saw was crucified and sacrificed - He has risen. Yes but now, can I say that he is my Jesus? I, properly speaking, do not know how my condition really is. Certainly, if you see it from His point of view, you can. To come to faith, is certainly nothing else than beginning to see this, such as God is seeing it. You can say that you agree with Him in your heart, as regards the testimony about Jesus‘ person and act. And this is certainly not something you can take yourself, rise yourself up to, decide yourself for or the like, it can only happen/be created by hearing The Word of Christ. He (Jesus) Himself is the propitiation for our sins" says the apostle John in his first letter, “and not for ours only, but also for those of the whole world.” Then I will ask: Is He your Jesus then? That means, is He then your salvation from God, when He now is the propitiation for the sins of the whole world? Where will you hide yourself, to get out of this salvation? The question is: Is He allowed to be this for you? I was personally asked once: "When Jesus now already has paid for all sins of the world, how can I then (and on the whole; anyone) perish?" By that you choose something else! "He is going ahead of you into Galilee, there you will (mind you this; will) see Him" (v.7), says the angel here, and repeats with that Jesus‘ promise unto them, which we are reading in chapter. 26:32: "But after I have been raised, I will go ahead of you to Galilee." And there He met them. See this in our coherence - what a Gospel (good message)! There does not exist words which can express it, when we get a glimpse of this. Great joy! For what is the Scriptures/His promise unto us? That He has gone ahead of us, has forced open all barriers, and paved the way for us straight into the Holy place, before the throne of God. There we will see Him, and we will be like Him. (1 John 3:2). Think! There does not exist a drop of suspense about this. That you one day will see Him there, and be like Him, that is just as certain as that you exist in this hour. Just as certain as He took your sins up on the cross. This is a promise of God, if your refuge truly is unto Jesus Christ, the crucified and resurrected. In other words He is both your atonement and your justification.